liver and onions! I know…not many folks like this, but Dave and I (and Sara!) love it! No idea. But my husband would have loved to have dinner with you. 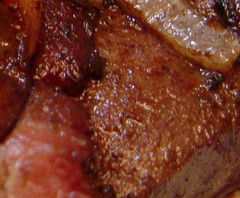 Liver and onions is one thing I do not cook. I want to guess bacon (I might be hungry) but if that doesn’t work, how about whiskers? Mrs. G…stole my answer!! ;-D That’s what i think it is…sure looks like it….except mine never come out looking like that…whoever pulled those out is gooooood. Is this weeks piccie cat fish whiskers? It looks like a fish fin. Polar bear hair? The only thing I can think of that is translucent and hollow like that. Ooh, no, it’s the foliage of a newly discovered planet and it glows neon colours in the dark! Or it could be the bones of the trout Dave caught the other day. Aloe Vera Plant? Thanks for visiting my Thursday Thirteen today! I have to agree with the bone guesses. I immediately thought of my mom when I saw the liver and onions. She loves it! I remember liking the smell of it cooking, but when I tried it, I just couldn’t swallow it. 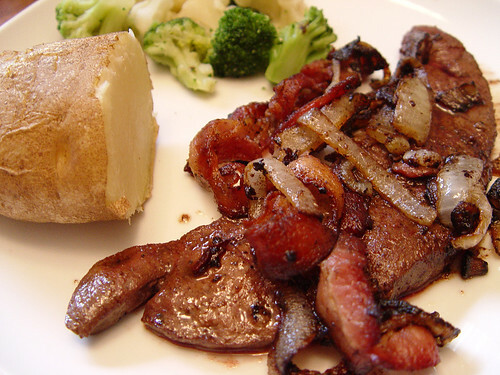 I just want to say that I love liver and onions, too, and think it’s? they’re? very delicious! The above pic is making me salivate a little.